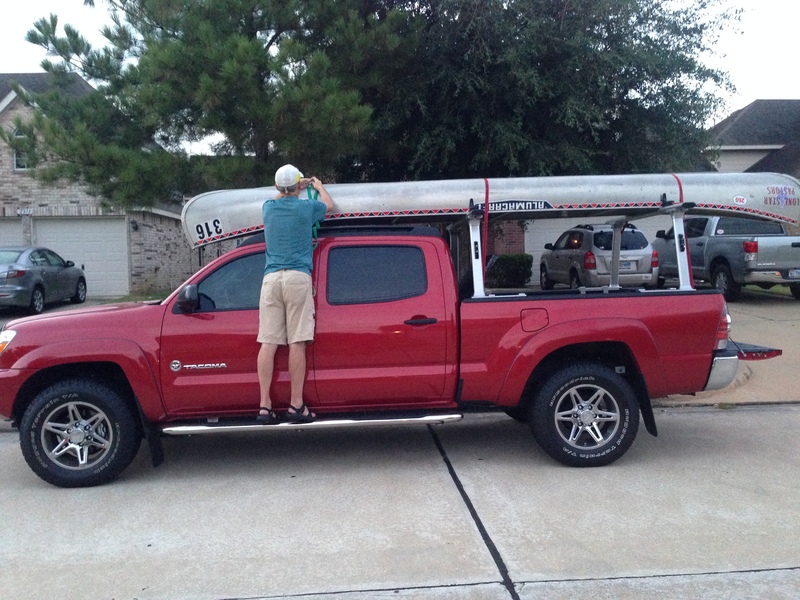 After a one year hiatus from canoeing, Doyle and I are finally back on the water — and we couldn’t be happier. 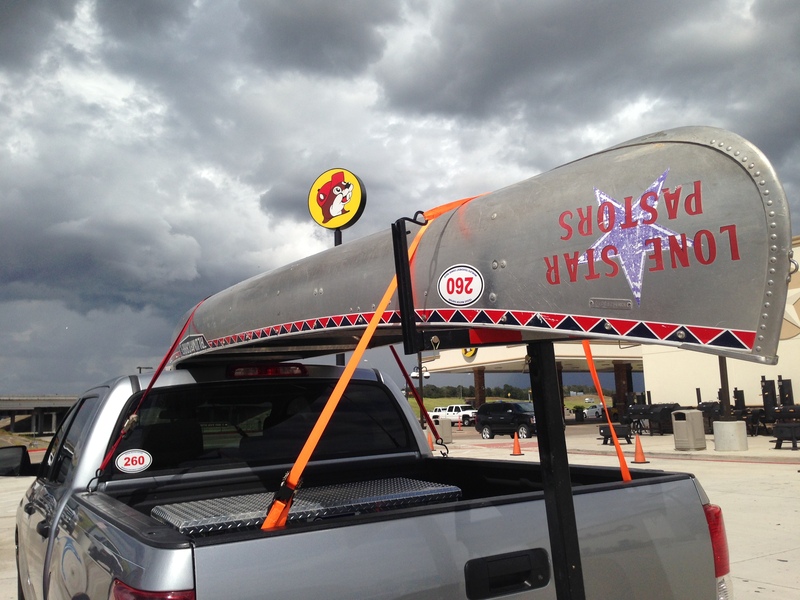 Early this morning we loaded our gear and strapped our canoe onto Doyle’s red truck, stopped by Whataburger for a quick breakfast taquito, and then headed West toward Luling to do our first training run in preparation for the 2015 Texas Water Safari. This 260-mile ultramarathon canoe race is billed as the world’s toughest canoe race. And indeed it is. Doyle and I crossed the finish line last year in a little less than 90 hours. We know that in order to compete in this brutal race you have to train, train, train. 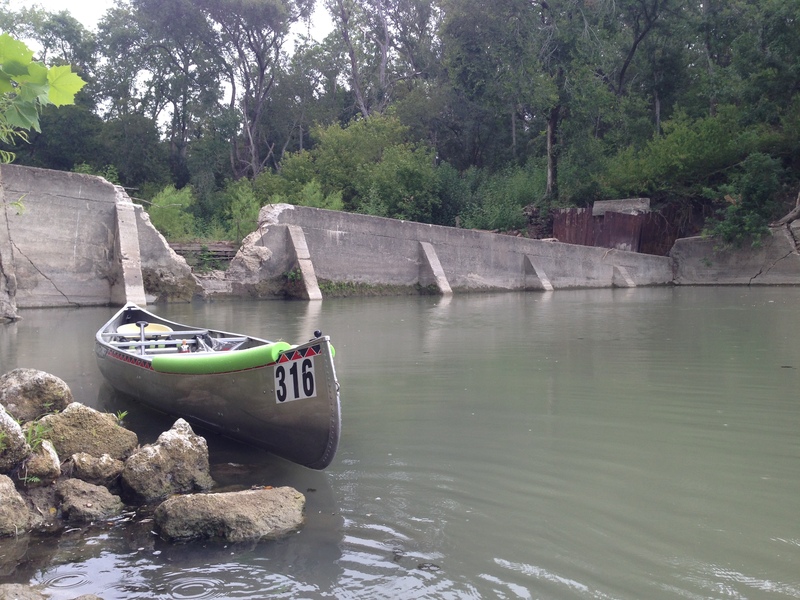 Today we decided to paddle the San Marcos River from Zedler Mill Dam in Luling to the low-water crossing at Palmetto State Park, one of the checkpoints on the safari. This 15-mile section of the race course offers some technical challenges to paddlers. And, to make things even more interesting, the river here is littered with all kinds of trees and logs swept here by floods in recent months. We thoroughly enjoyed the challenge of paddling around obstacles and seeing all of the changes on the river since we last paddled here. The section of the San Marcos River between Luling and Palmetto is also challenging because of the Son of Ottine Rapids. When Doyle and I did the safari last year, we arrived at these rapids late at night. We picked a good line, managed to avoid the rocks, and made it through without incident, saving us the time of portaging. 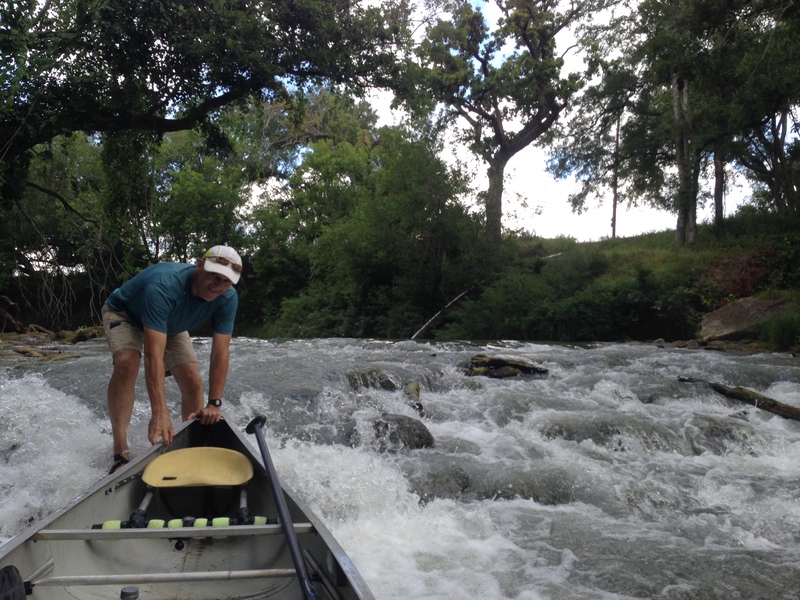 Because the water level was a little low today, we bottomed out on the rapids. But, no problem. Doyle hopped out of the canoe, gave us a nudge, and we were on our way. Ottine Dam is located a few miles down from the rapids. 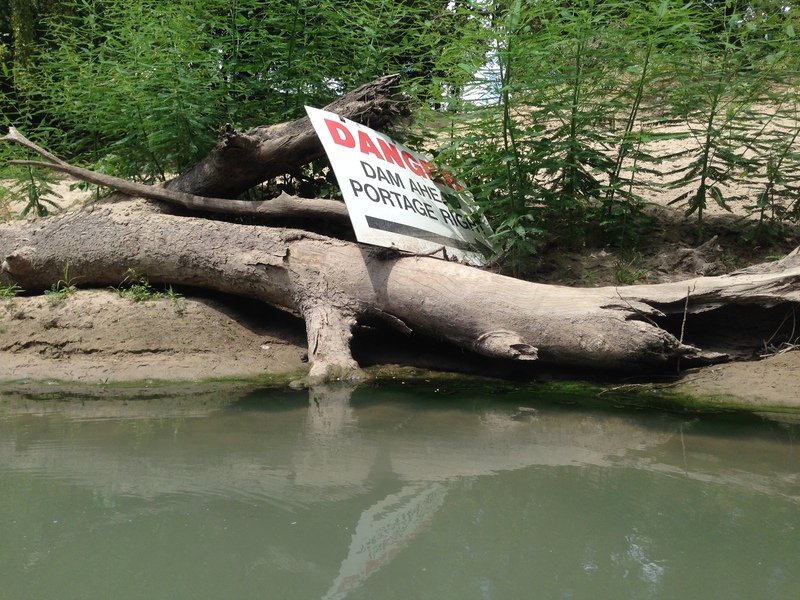 There is a required portage at this dam because it is deteriorating and dangerous. A paddler from San Marcos died here on a training run a few years ago. Thankfully, the dam is scheduled to be demolished. When we arrived at the dam we pulled our canoe up the sandy bank, dragged it around the dam, and then lowered it back down to the water. Once we hopped back into our canoe, the skies opened up and it rained on us all the way to Palmetto. No problem. The rain was refreshing. Although Doyle and I have not been in our canoe for almost a year, we thoroughly enjoyed today’s training run. We talked a lot along the way about last year’s race — what we learned from it, what we need to do different in order to improve our time next year, and about our next training run. We understand what it takes to do the safari and are committed to intentional preparation one training day at a time. I enjoy the safari because it is hard, it stretches me, and there is always the possibility that anything can happen along the way to keep us from reaching the finish line. These are all ingredients for a great adventure! Actually, we have to take two vehicles on our training runs. We park one vehicle where we end our training run and the other at the starting point. So, that is my silver truck in the last photo. Good eye for details! Enjoy the blogs especially the wordless Wednesday’s, they’re fun. Live to the maximum Sir.